This week Aubry and I made some new pillowcases for her bed! Pillowcases are a fun and simple way to add lots of color and fun, without spending a lot of money. This also brings up my own desire to re-make the ones on my own bed (shown in the picture) in order to use some of the fun, new prints in my shop. These ones on my bed now will go in the den to snuggle with while watching TV. I do have a favorite go-to tutorial that I always use, but I found a few more that seem like good choices. And most are perfect as a beginner sewing project! New quilt pieces are all cut and ready to go! And I am so excited about this one! A friend of mine gave me some fabric that used to be her grandmas, and it's a wonderful collection of happy prints. 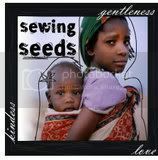 They are fabrics left over from dresses that she made her own daughters years ago. Now those pieces are destined to become a bow-tie quilt. I am going with Kona Pond for my background to give it a vintage-y look. There is really nothing modern about this quilt: vintage fabrics, traditional design, but I still like to think it fits into modern quilting. What about you? Are you working on anything new? It's all 25% off in my Etsy shop with discount code springintosummer! There are so many lovely prints and colors to chose from. I hope you all had a great weekend. I did, but I feel like I need one extra day to recover. I have that "is it really Monday already?" feeling! This week in my shop all LEAH DUNCAN prints are 20% off. You will find the full MORNING WALK Collection, as well as the MEADOW Collection. Leah's prints and colors are just beautiful. These lovely fabrics are great for quilting, crafting, and clothes-making, as well. I hope you are all enjoying a lovely weekend so far. Sunshine, shorts, and flip-flops are on my list for this weekend. Maybe a little bit of spring planting? Peas? Lettuce? This week in my shop all RECOLLECTION yardage and bundles are 20% off. This beautiful collection has a great selection of prints and colors...you are sure to find something that you love! my handmade shop is open once again! It's taken me a while, but my handmade shop is open once again! I have camera straps covers, buntings, and tablet pouches listed right now, and ruffled aprons and quilts are on their way soon. I will let you know when those are up too.